I used to love juicing but had a nasty habit of breaking blenders. I would be over optimistic about what they could actually pulverise. I also had a Champion Juicer at one time, for many years the absolute best there was. It could break down anything and make ice cream which was great, but my goodness it was such a complicated procedure to dismantle and clean. And it was too huge (and not very pretty) to keep on the counter top and extremely heavy. I just couldn’t be bothered any more so that was that. I also came to the conclusion it would be more nutritious to just eat the whole food. However, juicing has become very popular again. In America there are lots of juicing bars where people go in and stock up on them. So I’ve decided to re-look at the benefits of juicing. One of the biggest advantages is that it’s a great way to get your daily quota of vegetables. Somehow when things are liquid and mixed together, you find you can tolerate vegetables you don’t particularly like and hardly ever eat. Vegetables can improve your overall health and help protect you from heart disease, stroke, arthritis, dementia and cancer. A recent study found that people who consume 7 or more portions of vegetables and fruit a day have a 42% lower risk of dying compared to those who only have 1 portion. Vegetables are great at reducing stress. Green leafy ones like kale, spinach and chard are full of magnesium which helps balance your cortisol (a stress hormone). Avocados are serious stress busters and have anti-oxidants, healthy fats and folate. So juicing is a really great way to consume a much wider variety of vegetables which are literally teeming with micronutrients and good bacteria that most people are lacking. It actually helps you absorb all the nutrients from the vegetables by helping to “pre-digest” them which is helpful as most of us have impaired digestion as a result of some less-than-perfect food choices over the years. And let’s face it, most people struggle to consume the 6 – 8 portions of vegetables and fruits a day that nearly every health authority recommends. Juicing also promotes weight loss specially when added to a diet. The abundance of nutrients will also up your energy levels, boost your immune system and even support brain health. I have to confess that what inspired me to get juicing again was when I saw my friends’ new blender and the amazing things he was doing with it. 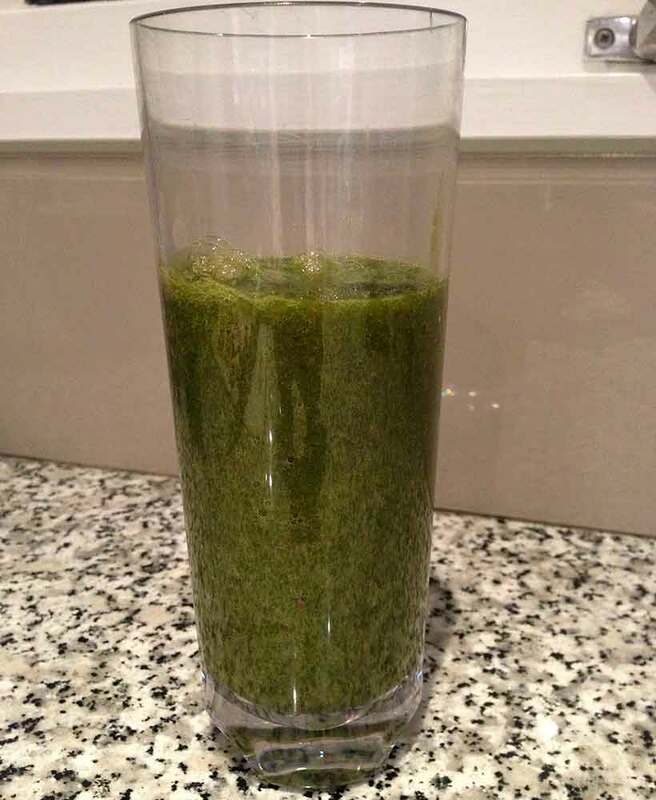 It looks like a normal blender but can do ANYTHING! It’s actually a commercial strength blender and is very powerful so I think even I would have difficulty breaking this one. And it’s EASY! That’s a big plus for me. Easy to use, easy to clean and fits perfectly on the counter. So of course, I had to get one. And I’m having a ball with it. It came with 2 online recipe books and to my delight, they were very healthy, grain and dairy free recipes. 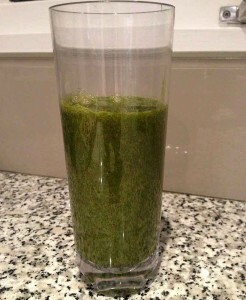 This green swamp like looking drink was my first attempt and those are all the ingredients in the blender before I blasted it. It’s called a Green Ginger Zinger and has cucumber, kale, celery, apple, ginger and water. I felt incredibly virtuous drinking that I can tell you! Juicing healthy vegetables is only part of what I’m doing with this machine. I made ice-cream from frozen bananas which, trust me, is good. 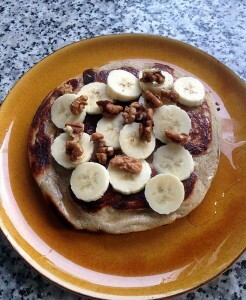 I also made pancakes (obviously just the mix as had to then cook them in a frying pan). They were made with almonds instead of flour and were delicious. 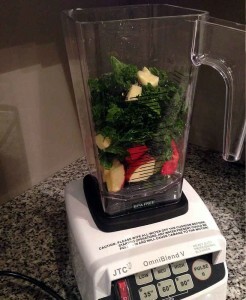 There’s an endless variety of things you can use the blender for. Soups, smoothies, milkshakes etc. You can also make your own almond milk or cashew milk or any kind of nut milk. You can use for cakes, breads, just about anything. I’m determined to make my way through the entire 2 books! You’re probably dying to know what this epic blender is so am supplying all the info. Commercial strength blenders can be expensive so this one is very reasonably priced I think. As ever, I always have my readers in mind, so contacted the company and they’ve agreed to give a £20 discount to anyone ordering from this site. My machine is an Omniblend V. Delivery in the UK is free and each blender comes with 2 downloadable recipe e-books. Thanks for the article, and break a leg in the upcoming “Beautiful”. It is a bummer not living in the UK some times. I’d love to see it.